SF State has been named one of the nation's top universities for successful applicants to the Fulbright U.S. Student Program, according to the Oct. 28 issue of the Chronicle of Higher Education. With three graduates accepted into the program during the 2013-2014 academic year, SF State ranked 19th nationwide among master's granting institutions. 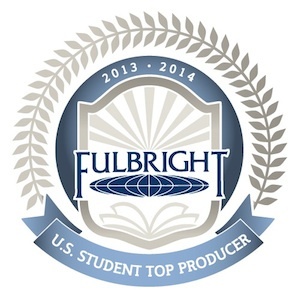 This distinction continues a legacy of success for SF State’s students and faculty in the Fulbright Program. Sponsored by the U.S. Department of State, the Fulbright Program is a highly competitive educational exchange with grants for students, teachers and professionals. The Fulbright U.S. Students Program provides funding for graduate students and recent graduates to conduct independent research or serve as English Teaching Assistants. "With three awardees we had a great success rate this year," said Joy Viveros, fellowship advisor and Fulbright U.S. Student Program Representative. The Fellowship Office, led by Viveros, aids student applicants during the six to nine months it takes to develop a complete Fulbright application. Faculty advisors conduct practice interviews and review application drafts. "We can only hope to maintain this same success rate as we increase the number of applicants. In March we'll start workshops for next year's application, due in September 2014," said Viveros. Two of this year's Fulbright Students, Meredith Simpson and Phung Nguyen, earned master's degrees from the Graduate College of Education. Both are now serving as English Teaching Assistants, Simpson in Mexico and Nguyen in South Korea. Erdem Durgunoglu, graduate of the anthropology master's program, was awarded a research grant to study Turkish culture and traditional butchering practices. Read more about Durgunoglu, Nguyen and Simpson here. The U.S. Department of State released the complete list of top producing colleges and universities, detailed in the Oct. 28 issue of the Chronicle of Higher Education. For additional information about the Fulbright U.S. Students Program and the application process, visit the Fellowship Office's website.